For the Russian-born, Paris-based Surrealist, it was also a perfect metaphor for the lifestyle he chose. Chagall has been described as the greatest Jewish painter of all time. His artwork shifts constantly from reality to fantasy, from physical to spiritual, just as his life brought him face to face with different worlds and conflicting sources of inspiration. He depicts Vitebsk as both “sad and gay,” and his early encounter with its sights and landscapes was both real and illusive. Chagall may have thought of himself as born anew on the roof of his home on Pokrovskaja Street, but the circumstances of his actual birth were perfectly ordinary. He was born Moshe Segal in Vitebsk, White Russia, in 1887. More than half of the city’s sixty thousand residents were Jewish. Chagall was the eldest of nine children born to Khatskl (Yehezkel), who worked for a herring merchant, and Feige-Ite, who ran a small grocery store. 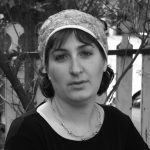 His Orthodox family struggled to make ends meet and found comfort, as did many Jews in Vitebsk, within the Hasidic Lubavitch movement. Like the famed Hasidic master Menahem Mendel of Vitebsk (1730–1788), who led one of the earliest emigrations of Jews to Ottoman Palestine, Chagall’s parents were Zionists, purchasing the Zionist Shekel – despite their poverty – to become official members of the Zionist Organization. 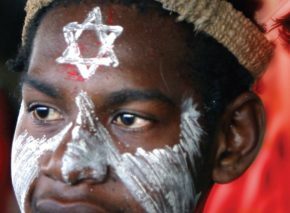 Young Moshe was drawn to folk culture, absorbing the vibrant sights and sounds of his town and its diverse population. Merchants, cantors, neighbors, and relatives all found their way onto his canvas. One of the most influential people in his life was his Uncle Noah, whose fiddle constantly played the rebbe’s klezmer melodies. 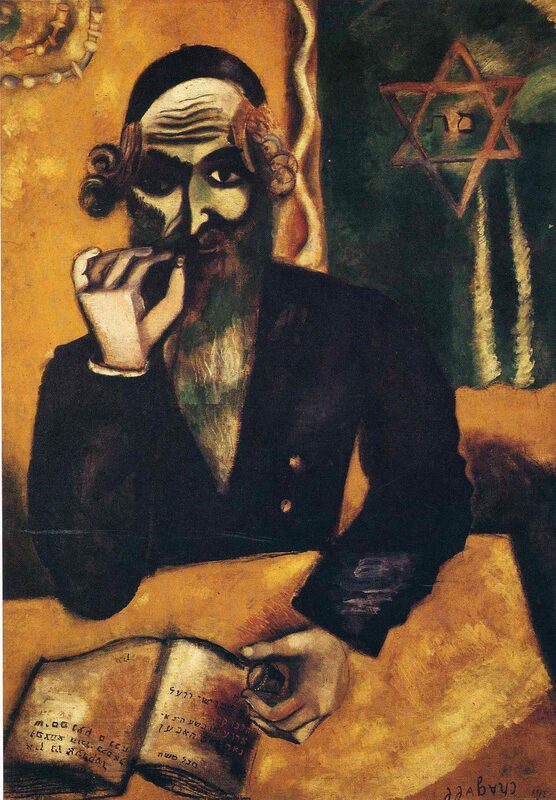 Chagall’s painting of his beloved uncle as a fiddler on the roof inspired the title of the well-known musical. But Moshe Segal absorbed much more than the flavor of the Jewish shtetl. Churches and monasteries with onion-shaped roofs towered over his home. Crucifixes met the eye at every turn, and pigs wandered the streets as freely as the dark-robed priests crossing themselves as they walked. Chagall always claimed he’d never shaken the Russian soil of his childhood from his boots; it clung to him all his life. Moshe’s education began in cheder, in Yiddish. His mother later bribed the local Russian elementary school to admit him despite his Jewishness. Moshe, by then Marc, never excelled at his studies and often stuttered when forced to speak Russian in class. In his sketching and geometry courses, however, he shone. He copied magazine illustrations into a special sketchbook, and his exceptional work excited comment. Chagall’s family fiercely opposed his decision to become a painter. Like most traditional Jews, the Segals belittled the plastic arts as a form of idol worship, and offering no financial security to boot. 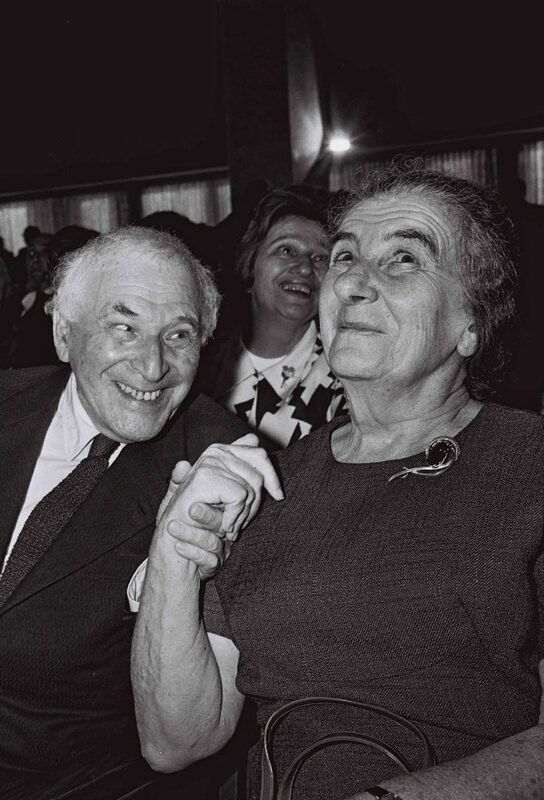 Finally receiving his mother’s blessing, nineteen-year-old Chagall began his art education at a private sketching and drawing school in Vitebsk run by Yehuda (Yuri) Pen. But Pen’s realistic documentation of shtetl life was not for him. So Chagall decided to move to St. Petersburg, Russia’s capital and cultural center, seeking inspiration in the European art schools favored by many of the city’s famous artists. His father reluctantly accepted his path. 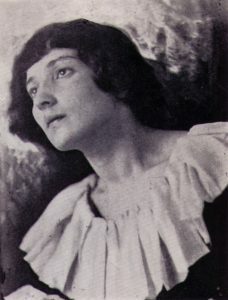 Despite the Russian law banning Jews from the capital, Khatskl Chagall obtained a letter from a local merchant authorizing Marc to purchase goods in the city. And he slipped his son twenty-seven rubles, making it clear that he would assist him no further. For the next three years, Chagall’s art was forged in poverty and despair. With no permit to live in St. Petersburg, he was in constant danger of arrest and even imprisoned for a spell. The Royal Academy of Arts rejected him, leaving him no choice but to study in a second-rate school. With no stipend for living expenses, he depended on the goodwill of local philanthropists. Despite these hardships, Chagall produced his most important early paintings in these years, developing his unique combination of Jewish and Russian folk art, modernistic techniques, Cubism, and Fauvism. 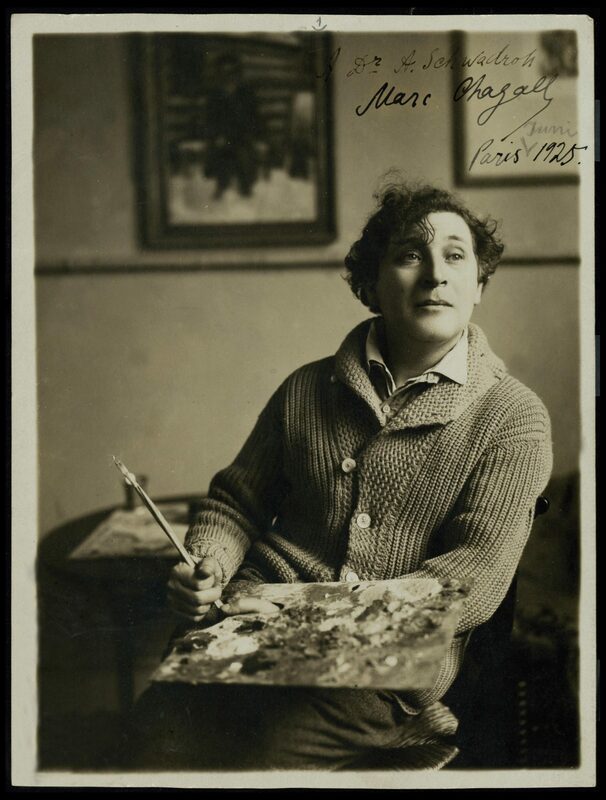 By 1910, Chagall was ready to leave Russia for the hotbed of art and culture that was Paris. Wary and unsure, he bade farewell to his beloved fiancée, Bella Rosenfeld, on a brief visit to Vitebsk. “God, Thou who hidest in the clouds, or behind the cobbler’s house,” he prayed, “lay bare my soul, the aching soul of a stammering boy, show me my way. I do not want to be like all the others; I want to see a new world” (ibid., p. 95). Paris in the early 20th century was the vibrant heart of the European art world. Overflowing with museums, salons, and art workshops, it hummed with animated debate between the proponents of the various new schools of expressionist art. Chagall the individualist, who had felt smothered in Russia, hemmed in by his Jewish identity, thrived on the opportunity to blend into the colorful, cosmopolitan atmosphere of the City of Light. After several months in rented quarters, he moved to La Ruche (the Beehive) – a complex of one hundred studios and communes of young artists from all over the world. He painted feverishly, barely eating or sleeping. When he couldn’t afford canvas, he would rip off his own shirt and use it instead. Though admired among the great Parisian artists, Chagall was unknown to the public. There was no market for his work, and he had difficulty mounting his own exhibitions. He finally held his first successful solo exhibit in Berlin in 1914, but the resulting wave of success was disrupted by a trip to Russia for his sister’s wedding and to see his fiancée. World War I and the Communist Revolution turned what was supposed to be a brief visit into an eight-year stay. This quirk of fate made a family man of Chagall, and these years proved to be some of the happiest of his life. He married Bella in 1915, and their daughter, Ida, was born a year later. 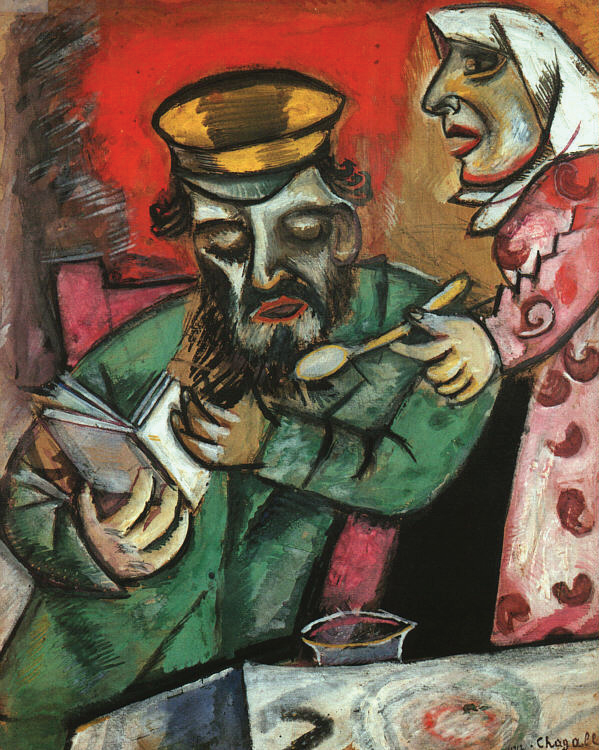 Family portraits feature heavily in his art from this period, as do paintings of Jewish life in the shtetl, a world Chagall intuitively felt to be on the verge of extinction. Inspired but not cramped by the styles and techniques he had encountered in Paris, his art gained a fresh, innovative perspective, and he exhibited across Russia. Chagall’s free spirit was a far cry from the pragmatic ethos of the revolution, and his frequent clashes with colleagues led to mounting frustration. Finally, like many other Jewish artists, he turned to preserving his Jewish heritage, officially perceived by the state as part of Russian folk culture. His wife was pleased by the shift, as she was more traditional than he. In 1920 Chagall started working for the State Yiddish Camerie Theater in Moscow. Theater was an almost religious experience for him, involving all the senses as no other art form could. He set about designing sets and costumes, but his temperament made it hard for him to work within a rigid framework, and this job too didn’t last long. The Soviet government soon began thwarting all cultural activity deemed counterrevolutionary, and Communist society was starting to irk Chagall. 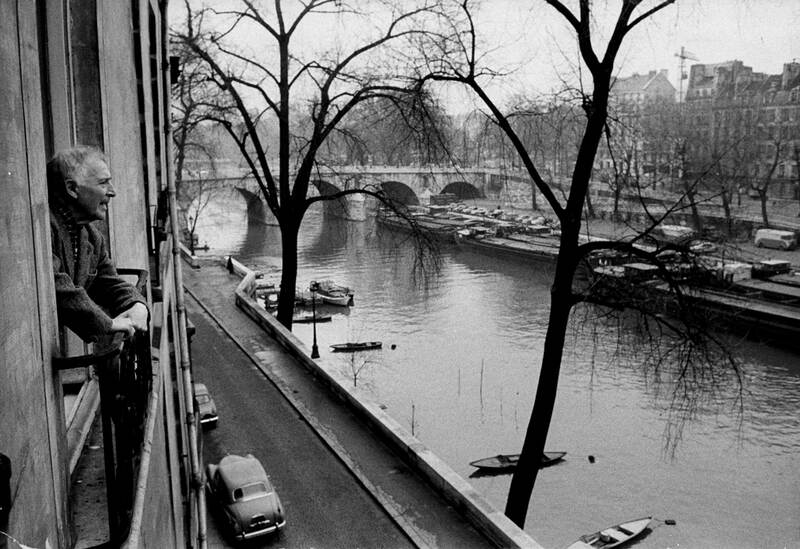 In 1921, disillusioned, he returned to Paris. 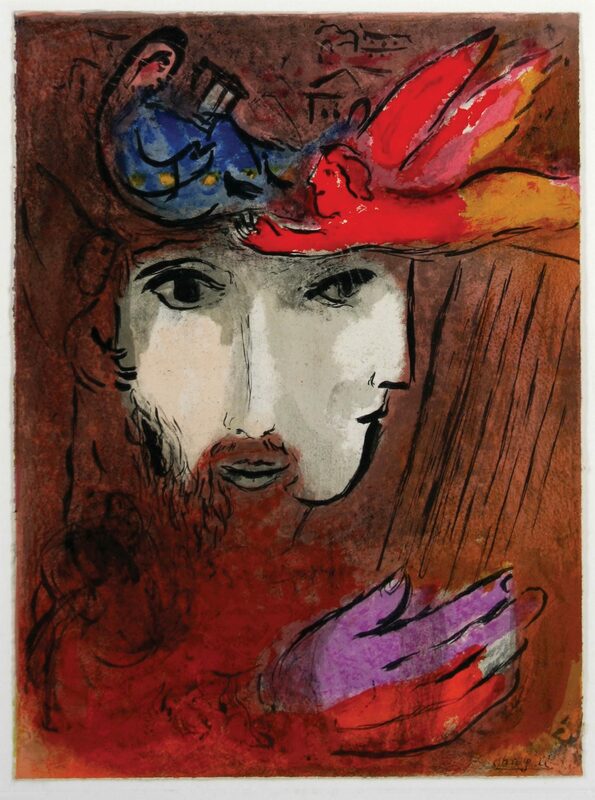 Before leaving Russia a second time, Chagall completed his illustrated autobiography, My Life. He sensed that a significant chapter of his life had ended and an exciting new one was about to begin. Once in Paris, Chagall imbibed the heady atmosphere of political freedom and artistic license like a drug. 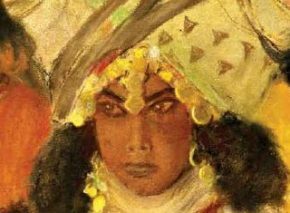 By now a world-renowned artist, he portrayed love, family, and nature in vivid colors and flowing lines; Jewish motifs gave way to vibrant landscapes and portraits of circus life. 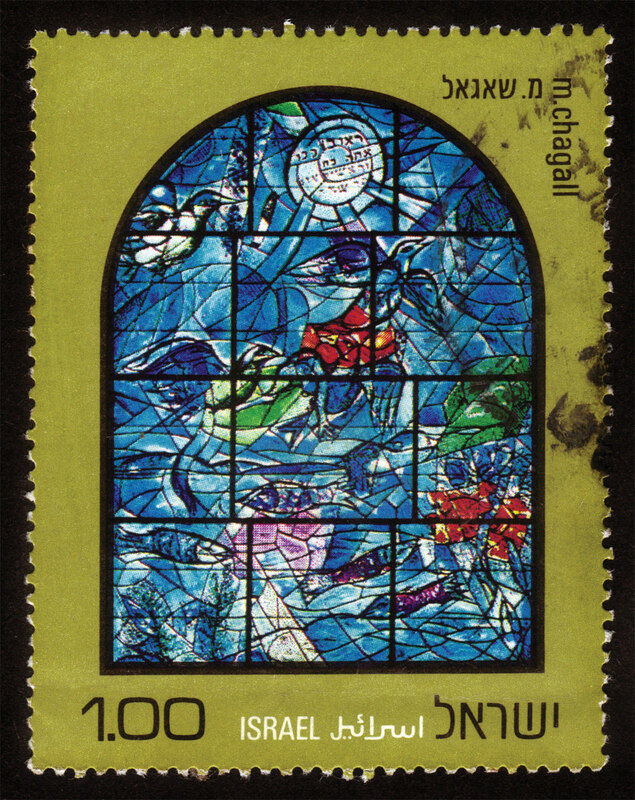 Then Ambroise Voillard, owner of a French art gallery, commissioned Chagall to paint a series of Bible illustrations, and he used the job as an excuse to tour Palestine in 1931. Returning two months later, he threw himself almost obsessively into the project for three years. Whereas art critics claim these illustrations owe more to European artistic traditions than to Jewish sources (and in fact, Chagall spent time in Amsterdam studying Rembrandts and El Grecos on biblical themes), the artist himself felt he’d turned a corner. 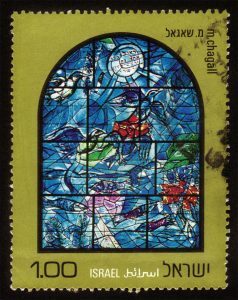 By the outbreak of World War II in 1939, Chagall had painted sixty-six illustrations, though he completed the series only in 1956. 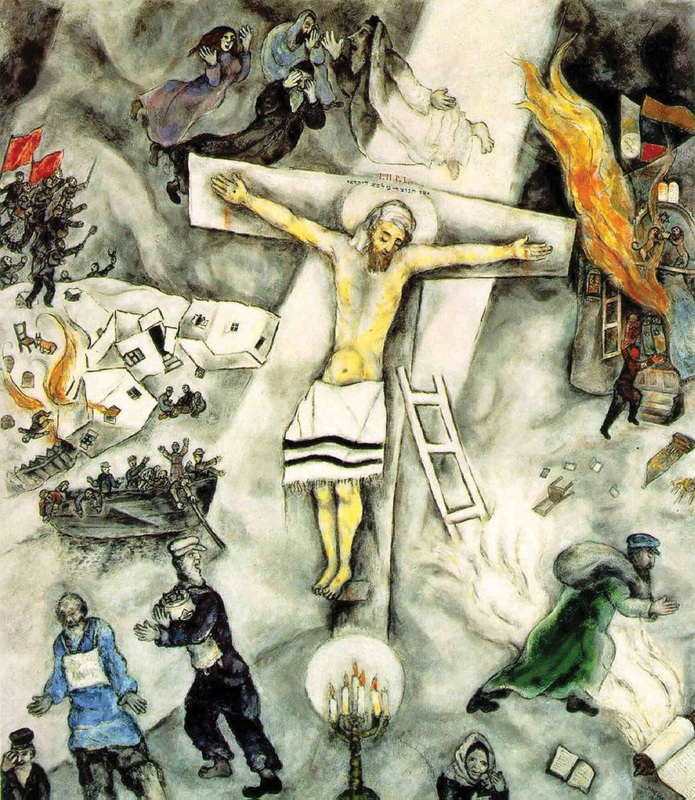 Ironically, it may have been the Nazis who established Chagall as a Jewish artist. 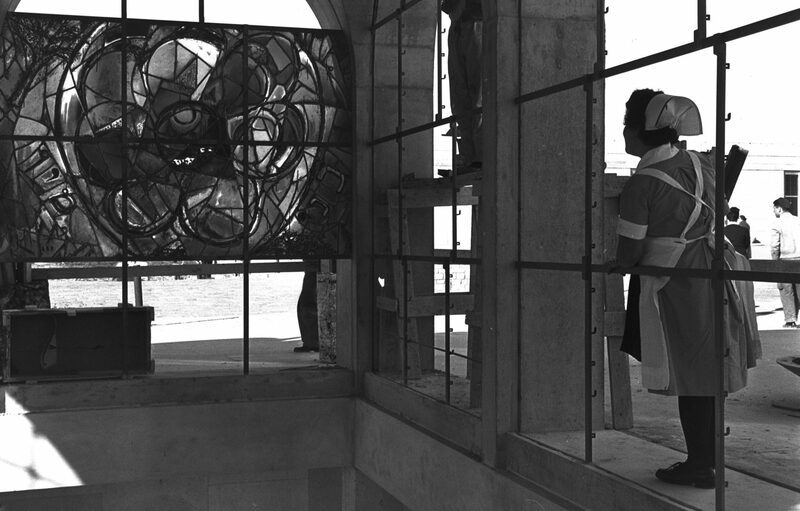 In 1937 Joseph Goebbels, the Nazi propaganda minister, decreed that all paintings by Chagall in public collections in Germany must be burned along with the works of other “degenerates.” Only his Pinch of Snuff was saved, to be displayed in Goebbels’ “degenerate art” exhibition. Visiting Vilna in 1935, the artist had sketched picture after picture of the city’s Jews, reverting to realism as if to perpetuate a world soon to be destroyed. As Nazi occupation threatened France, Chagall was too absorbed in his work to realize the danger, and rejected several attempts to help him escape. After the Vichy government adopted discriminatory Nazi laws, he was arrested and then released due to American intervention. In 1941, the artist finally fled to the United States with his wife and daughter, remaining there until the end of the war. After World War II, Chagall once again distanced himself from his Jewish background, perhaps to cope with his wife’s tragic death from a virus in 1944. 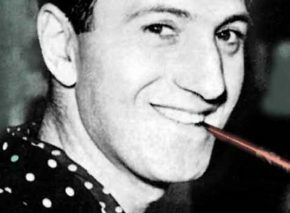 Just a few years later, he struck up a relationship with Virginia Haggard, a non-Jewish divorcée of Irish origin who bore him a son, David McNeil, in 1946. In 1952, Chagall married Valentina (Vava) Brodsky, who was Jewish but completely unattached to tradition. His work focused on universal themes, often incorporating motifs from Greek mythology and Christianity. 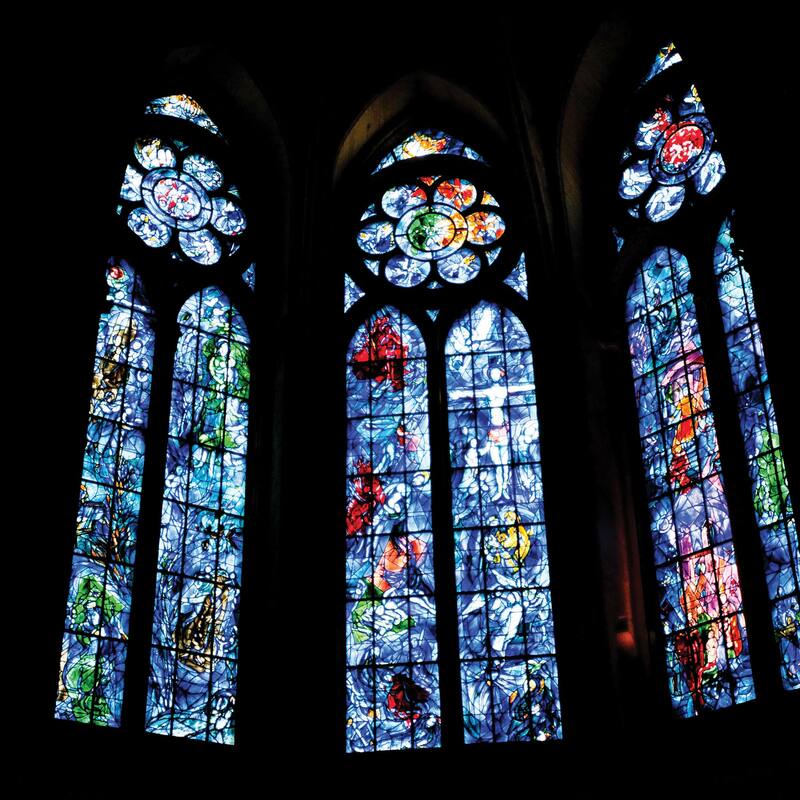 He designed the interiors and richly colored stained glass windows of numerous churches and cathedrals in France and Germany. 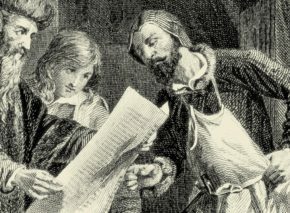 And he bequeathed his masterful Bible illustrations, to which he had devoted more than two decades, to the French city of Nice. 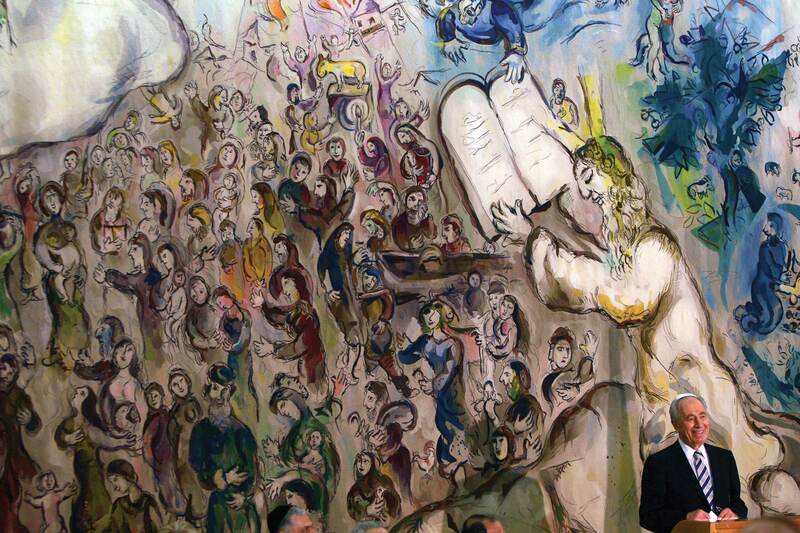 Nevertheless, Israel and the Jewish people occupied Chagall in various ways. He visited Israel six times, five of them after the establishment of the state. On his first visit, he even seriously considered Tel Aviv mayor Meir Dizengoff’s suggestion that he remake himself as a “new Jew” by settling in the city and helping to set up the Tel Aviv Museum. 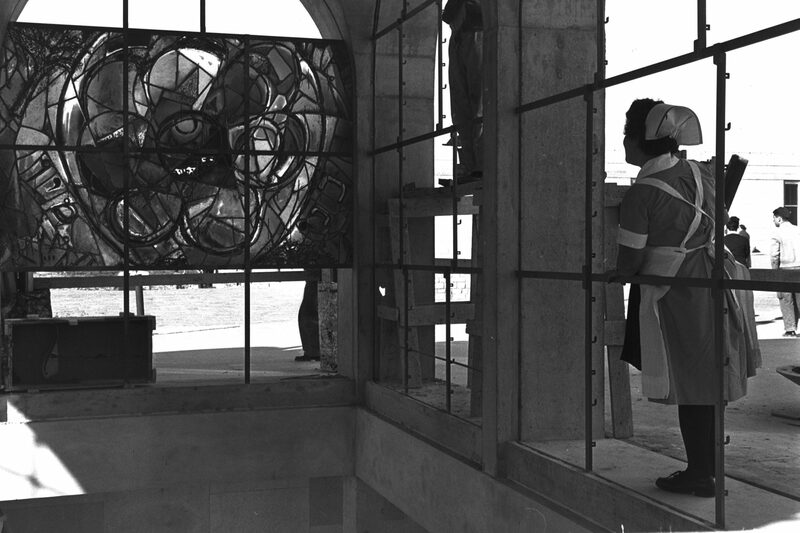 Later, the artist readily agreed to design stained glass windows for the synagogue in Jerusalem’s Hadassah Medical Center as well as the wall hangings and mosaic floor of the new Knesset building.